We’d love your help. Let us know what’s wrong with this preview of Brave Irene by William Steig. "Brave Irene" is Irene Bobbin, the dressmaker's daughter. Her mother, Mrs. Bobbin, isn't feeling so well and can't possibly deliver the beautiful ball gown she's made for the duchess to wear that very evening. So plucky Irene volunteers to get the gown to the palace on time, in spite of the fierce snowstorm that's brewing-- quite an errand for a little girl. But where ther "Brave Irene" is Irene Bobbin, the dressmaker's daughter. Her mother, Mrs. Bobbin, isn't feeling so well and can't possibly deliver the beautiful ball gown she's made for the duchess to wear that very evening. So plucky Irene volunteers to get the gown to the palace on time, in spite of the fierce snowstorm that's brewing-- quite an errand for a little girl. To ask other readers questions about Brave Irene, please sign up. One of my favourite books as a kid was Brave Irene. The story is about a girl who has to deliver a dress to the duchess in the midst of a snowstorm. It's a lovely representation of a daughter's love for her mother. The first few pages always get to me even though the story isn't sad. It's one of the few books that still has me feeling the same way I did when it was first read to me. Me lo leí en un ratito libro que tuve en el trabajo y me pareció supercuqui para los niños. Es un cuento donde nuestra protagonista, Irene, decide ayudar a su madre a cumplir una ardua tarea. Y es que tiene que entregarle un vestido a una ¿duquesa? (si no recuerdo mal) y su madre ha enfermado y no puede llevárselo. ¿El problema? Está cayendo una ventisca horrible, y aún así Irene hará todo lo posible por hacerle llegar el encargo por todo lo que ha trabajado su madre en él. Sin duda un libro idea Me lo leí en un ratito libro que tuve en el trabajo y me pareció supercuqui para los niños. Well, hmm, this book is sort of weird. I saw it on a shelf at the library and I liked the cover illustration and so I gave it a try. I did like the pictures. My favorite is of Irene by the fire eating and the two dogs looking at her, and most of the outdoor scenes, but all of the illustrations were ones I’d have loved as a kid, including all the details of Irene’s and her mother’s house and the palace interior and people also. But why the heck doesn’t the duchess send her people to come get the go Well, hmm, this book is sort of weird. I saw it on a shelf at the library and I liked the cover illustration and so I gave it a try. And I loved the illustrations of what the wind was doing but the wind being call wicked? That was sort of peculiar too. And there was one very scary & depressing part that might be too much for young kids. Imagine being covered in frozen snow from head to toe with only your hands sticking out! 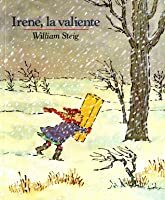 Well in the book Brave Irene by Willam Stieg, Brave Irene teaches us that always be brave, because when the storm was raging and she could barely see she still was brave enough to keep going! Another time is when she lost the dress she was brave enough to go to the dutches and tell them “I lost your dress! The last way is when she was covered in frozen snow she still was brave and tried to get out. 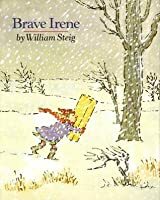 Brave Irene teaches us that always be brave because on page four it says “the snow was up to my ankles and I could barely see!” This proves that she was brave because she can barely see and the snow is up to her ankles! Imagine being stuck in a snowstorm and you can barely see! Probably no but Brave Irene was brave and persevered through the storm! You guys should also be brave and persevere through hard times. This was one of the books I used for my author's study for my high comprehension students in small group. Great book and I included Shrek, Dr. Desoto and Amos and Boris for this study. Had.a lot of.fun.with it! Update October 18, 2017: Per my second graders - I liked it because she was brave and she didn't give up. I liked it because she's cool. This is a new addition to our children's library. It's a great book about perseverance and courage. Strong female roles are represented here, both in the mother and the daughter. Would probably be a particularly good book for a single mother/daughter household. Ideal for ages 4-6. What would you do if your mom was sick and you had to bring the dress your mom made the duchess even though it was there was a blizzard outside? Because in the story Brave Irene by William Steig that’s exactly what happened. What I think this story teaches is to persevere even if times are hard. Why I think this is when Brave Irene takes her mom’s dress to the duchess even though there was blizzard outside, when she keeps walking forward even when she lost the dress her mom made and most of all What would you do if your mom was sick and you had to bring the dress your mom made the duchess even though it was there was a blizzard outside? Because in the story Brave Irene by William Steig that’s exactly what happened. What I think this story teaches is to persevere even if times are hard. Why I think this is when Brave Irene takes her mom’s dress to the duchess even though there was blizzard outside, when she keeps walking forward even when she lost the dress her mom made and most of all is when she gets up from being buried in the snow. No matter how we try, we can't keep our children wrapped in fluffy cotton for their entire lives. Irene is a good role model, for both boys and girls. I loved that Irene kept her spirits up by personifying the wind, talking back to it. The story is a little long and probably best for ages 6-9 or so. Great children’s book about doing my hard things and not giving up. Brave Irene is a classic picture book about a kind and persistent girl. A perfect winter read-a-loud to read to Second and Third graders. Irene is a dressmaker's daughter. Her mother has just finished making a beautiful gown intended for the duchess to wear at that night's ball, but is feeling too sick to deliver it. Irene volunteers to take the gown to the palace herself. Her Mom is hesitant at first, due to the size of the package, the long journey to the palace, and the fact that it started t Brave Irene is a classic picture book about a kind and persistent girl. A perfect winter read-a-loud to read to Second and Third graders. Irene is a dressmaker's daughter. Her mother has just finished making a beautiful gown intended for the duchess to wear at that night's ball, but is feeling too sick to deliver it. Irene volunteers to take the gown to the palace herself. Her Mom is hesitant at first, due to the size of the package, the long journey to the palace, and the fact that it started to snow, but relents in the end and let's her go. This errand turned into quite an adventure for Irene, especially due to the big storm that is making it really hard for Irene to reach the palace. Irene faces lots of obstacles on the way and will definitely earn the right to be called Brave Irene. I'm currently experiencing a wonderful opportunity of having free access to some of the best picture books ever written. This one is called 'Brave Irene', a little girl who truly loves her mother. This is pretty much a fairy tale. It has such good vocabulary words as well as such a nice lesson. Putting other people first and doing your best is always the best thing to do. It has a very happy ending, too. 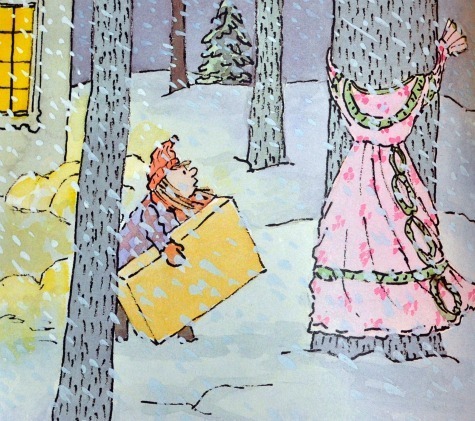 We love this wintertime tale of a little girl braving the elements to help her Mama. William Steig has a knack for tapping into something strange and adventurous as kids interact with the adult world. Read this to a second grade class and it went over well. It is a story I really enjoy, but a bit long for story times so this worked out well. I used to show it when we had preschool movies and it was quite popular. Irene gets 5 stars! She took care of her sick mother, braved the storm, fought the wind and delivered the package. She was amazing and that's why she was successful! Irene vs nature. Spoiler: Irene wins! While I'm not particularly fond of Steig's illustrations, the story is very special. What a beautiful example of perseverance, determination, and thoughtfulness. This book was fun and engaging as well. My children love stories where the hero overcomes the odds and moves into a happy ending. Sometimes challenges are just there for you to climb over them. I like this story because it features an ordinary girl who rises to the occasion and does what needs to be done. It was one of our Summer Reading titles, though it is not very summery. Synopsis: Inspiring story about a young girl, named Irene, who helps her mother deliver a package. The special package is a dress Irene's mother has made for a duchess, who lives in a palace a good distance from Irene's home. When Irene's mother becomes ill, Irene offers to deliver the package on foot, through wind and snow, to the palace. Irene's journey proves to be very difficult. At one point, the little girl loses the dress and trudges on with the empty box to the palace if only to explain what has happened to the duchess. The end of the story finds Irene, the box, and the dress, safe inside the palace. The next day, Irene is returned, "special delivery", compliments of the duchess' staff, to her home. Tell about a time in your life when you had to be courageous. Describe what happened and how it made you feel to show courage. 2) Gift wrap an empty box and place it on a table top in the classroom. Have children imagine that the box contains a gift for a special friend or relative. Then have children write short stories about the gift. Encourage children to include the following information: Who is the gift for? What is this special gift? Why will this gift make the person happy? How do you feel about giving this gift to your special friend or relative? Later, display children's stories, along with the gift box, in the classroom. I really don't understand the appeal of this book, honestly. It's a fine book, in much the same way that a spoon is a fine instrument--serves a purpose, but isn't remarkable in any way. The story is about Irene, daughter of a dressmaker, ensuring her mother's hard work is delivered to a duchess (on the DAY OF THE BALL ITSELF that's just poor planning) by trekking through a snowstorm. Honestly, it was kind of boring, which really shouldn't be the case. And I can't put my finger on why it was borin I really don't understand the appeal of this book, honestly. It's a fine book, in much the same way that a spoon is a fine instrument--serves a purpose, but isn't remarkable in any way. This review has been hidden because it contains spoilers. To view it, click here. One of my favorite books, discovered with my daughter when she was 4 years old and had the capacity to sit for longer picture books. We both loved it and read it over and over. Quite long, though - and very purposefully so, because you really experience the feeling of wanting to give up, but knowing there is no respite until you reach safety. Irene gets some breaks, as well as bad luck, but the payoff is that she gets not only treats but also her mother's love, gratitude, and respect at the end. One of my favorite books, discovered with my daughter when she was 4 years old and had the capacity to sit for longer picture books. Quite long, though - and very purposefully so, because you really experience the feeling of wanting to give up, but knowing there is no respite until you reach safety. Irene gets some breaks, as well as bad luck, but the payoff is that she gets not only treats but also her mother's love, gratitude, and respect at the end. Such a sweet book with amazing illustrations. The story follow Irene, a little girl, that wants to help her Mother, a seamstress who is creating a beautiful gown for the Duchess, but is not well enough to take the finished dress to the castle. So Irene takes on the challenge of delivering the dress in a blizzard. Irene is very brave and I highly recommend this cute little book to everyone of all ages. "Brave Irene" is a beautifully illustrated story of a young girl whose courage and determination lead her to overcome a snowstorm and fierce winds to accomplish her mission, delivering the ball gown to the duchess in time for the big party. Irene is a delightful and honorable girl with modern day characteristics. September 2017 - we listened to the audio recording by Meryl Streep first, and I definitely heard her voice in my head while reading it aloud. It's both a quiet story and a story of bravery, and if he were a new author today, someone would probably want to edit down Steig's wordy storytelling, and it would a shame to lose all those perfectly chosen words. Mrs. Bobbins, the dressmaker, who is Irene's mother has finished the gown for the Duchess, but she is too sick to deliver it in time for the ball. Irene tucks her mother into bed, and braves a snowstorm to deliver the gown. Things don't go as well as expected, as the wind interrupts Irene's travels, but Irene is determined to get the gown to the palace. Mother's Day is less than a month away and Irene Bobbin has me convinced that I need to step up my game. 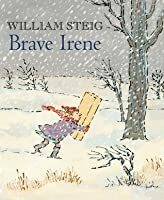 "Brave Irene," is how she is referred to in the title of William Steig's enduring story. She more than proves herself worthy of the attribute. I grew up in Michigan and I know that winter and its fierce, icy winds can be a formidable foe, but Irene's devotion to her mother makes her a strong-willed challenger. Mrs. Bobbin, Irene's mother, is a dressmaker and she has just put the finishing tou Mother's Day is less than a month away and Irene Bobbin has me convinced that I need to step up my game. 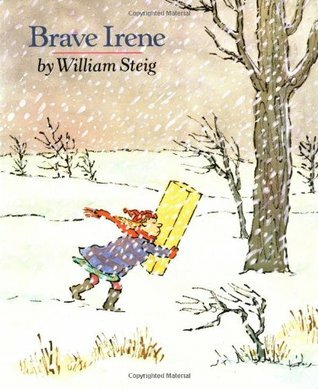 "Brave Irene," is how she is referred to in the title of William Steig's enduring story. She more than proves herself worthy of the attribute. I grew up in Michigan and I know that winter and its fierce, icy winds can be a formidable foe, but Irene's devotion to her mother makes her a strong-willed challenger. Mrs. Bobbin, Irene's mother, is a dressmaker and she has just put the finishing touches on a beautiful dress for the duchess, who is to wear it to a ball that night. Unfortunately, Mrs. Bobbin has fallen ill and won't be able to deliver it to her. So Irene volunteers to deliver the gown on her mother's behalf. Mrs. Bobbin is not comfortable with the idea. "No, cupcake, I can't let you," said Mrs. Bobbin. "Such a huge package, and it's such a long way to the palace. Besides, it's starting to snow." But Irene has made up her mind. As soon as she steps out the door, though, Irene's resolve is tested by the intense cold, whirling wind and falling snow. This mischievous wind taunts and teases her. Mr. Steig gives the wind human characteristics, which make for vivid storytelling. "Go home!' the wind squalled. 'Irene...go hooooooome..." It won't leave her alone. "The wind wrestled her for the package - walloped it, twisted it, shook it, snatched at it." One of my favorite sentences in the book is when he uses the idea of the gown and the upcoming ball to describe the wind's actions. "She [Irene] pounced and took hold, but the ill-tempered wind ripped the box open. The ball gown flounced out and went waltzing through the powdered air with tissue-paper attendants." Steig's books reflect his conviction that children want the security of a devoted family and friends. When Sylvester, Farmer William Steig was born in New York City in 1907. In a family where every member was involved in the arts, it was not surprising that Steig became an artist.